Arguably Thailand’s most famous dish, tom yam kung (also written as tom yum goong/gung) has a reputation for being universally loved by Thais as well as overseas visitors to Thailand. 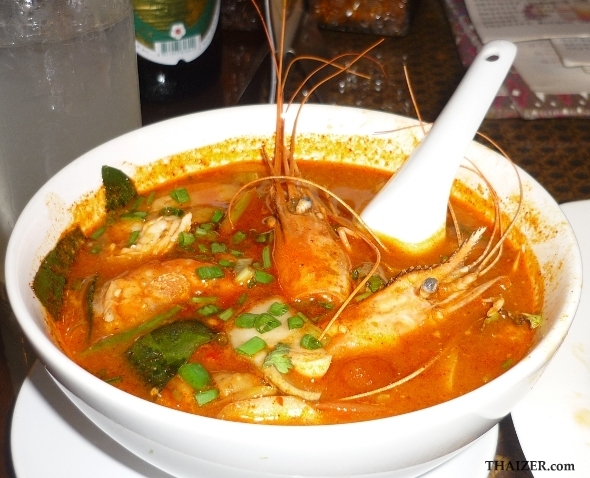 The classic spicy shrimp soup can vary in terms of spiciness and the thickness of the broth which can range in colour from clear to a rich red/copper as individual restaurants and cooks place their own unique spin on this quintessentially Thai dish. The main ingredient in the soup is shrimps (kung in Thai). Shrimps by themselves are a great source of protein, but when combined with an array of healthy vegetables and herbs, it makes tom yum kung into a nutritious bowl of goodness that is hard to resist. Here are just some of the reasons why tom yam kung isn’t just tasty, but it is officially good for you too. Eating chillies is known to be beneficial for blood circulation, the heart and the respiratory system and also helps to burn fat. Kaffir lime leaves aid digestion and are good for the teeth and gums. Lemongrass has an abundance of positive attributes for the body which include aiding digestion, fighting coughs and colds and having a cooling effect on body temperature. Limes are know to be good for digestion and are also a source of vitamin C which helps to combat colds and promotes healthy skin.